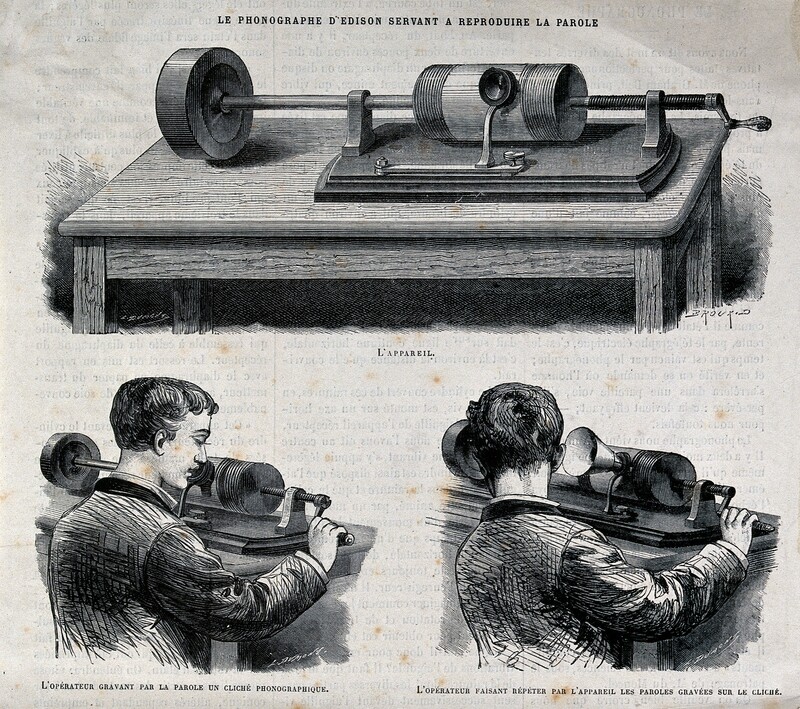 An Edison wax cylinder recorder. Wood engraving. From Welcome Images, used under CC 4.0. Continuing the thoughts from the most recent article, I dig deeper into how UX architecture pervades the entire enterprise, assuming the enterprise has anything to do with people. World-class UX architecture is world-class systems design. It takes an ecosystem approach to considering the users’ experience of the enterprise’s products and services. UX architecture identifies, describes and designs an ecosystem of use for an organization’s product or service. What constitutes such an ecosystem? Where does an “ecosystem of use” begin or end? 10 years ago, the answers to those questions were still emerging. Today, we have a body of work to help inform our understanding of such an ecosystem. Enterprises that have taken that journey already employ UX architects. Many others remain skeptical because they haven’t transitioned from an “inside-out” to an “outside-in” perspective of their organization. An ecosystem of use places the enterprise in the larger context of its users and their needs, a fundamentally different way of looking at the mission and purpose of the organization. Over the past 10 years, with the emergence of Customer Experience, marketing professionals have provided customer journey maps. 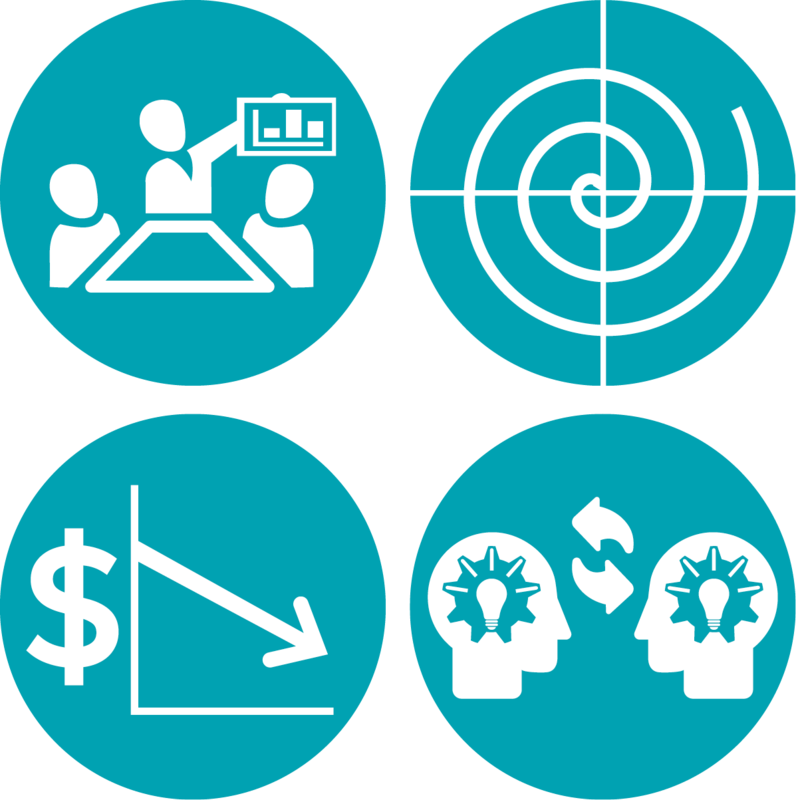 These illustrate how people are currently being served by the enterprise and how the organization can better serve them. Jim Kalbach’s recent book (Mapping Experiences) provides a reference to the rich world of mapping, including customer journey maps. I’ll offer up a variation of such a map as a bird’s eye view of the ecosystem of use, for which a UX architect is responsible. I call it a User Lifecycle Map. 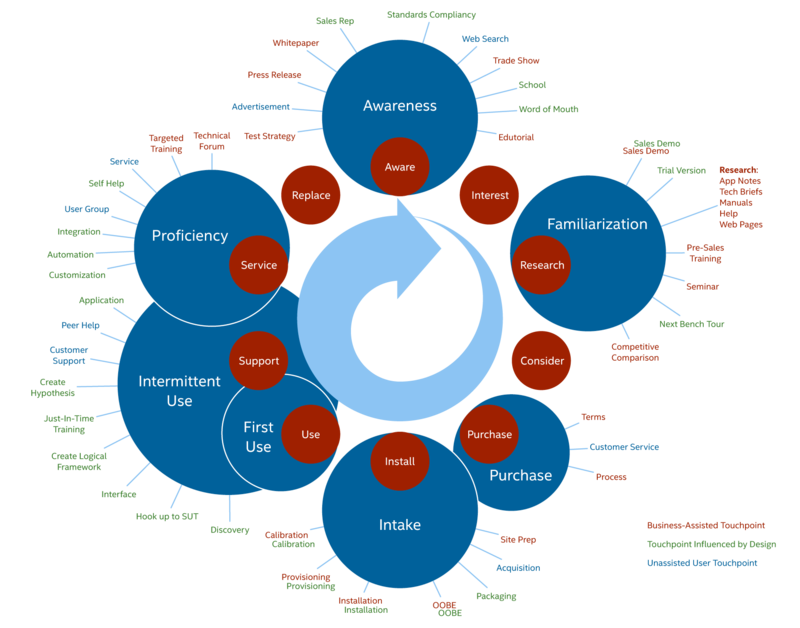 The User Lifecycle Map is based on a much more commonly used diagram—the Sales Process Map. 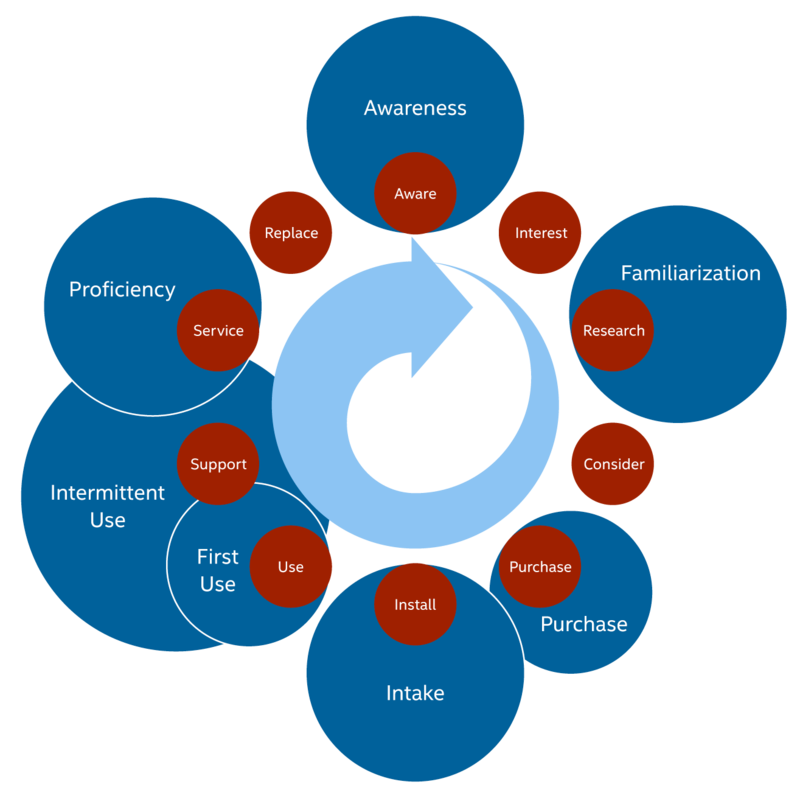 The red circles represent the typical stages we move through when engaging with a new product or service. We begin with awareness. If something catches our eye, we move into the “interest” stage, investing in research, consideration and ultimately purchase. Those stages describe our transition from “prospect” to “customer.” Once a customer, we become a user and continue through the stages until we become aware of new products or services, upgrades or additional capabilities of the system we’re already using, and the cycle begins anew. Several variants of this cycle have been around for years, used by marketing departments to identify and improve sales and customer satisfaction. Different enterprises have different names and number of stages, but the basic structure is the same: moving an individual from prospect, to customer, to user to prospect again. 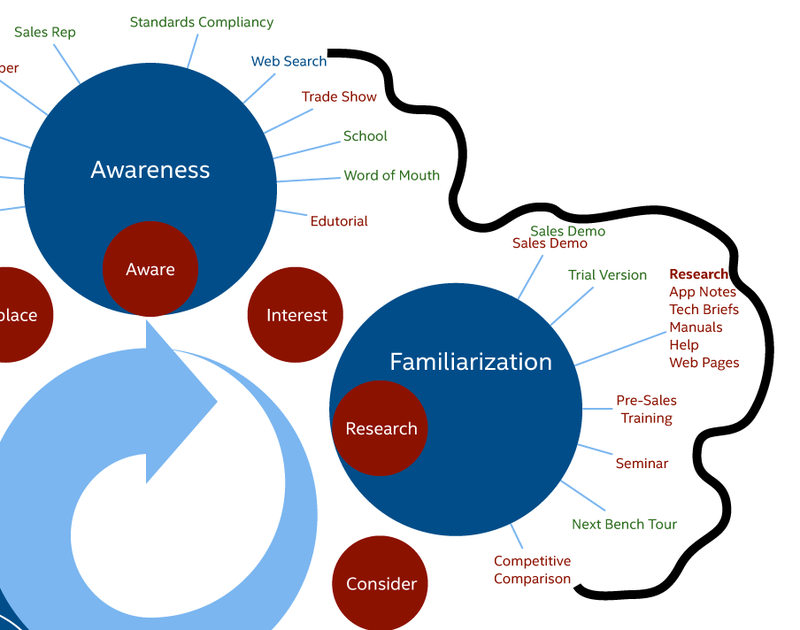 This form of the map is an “inside-out” view of the customer’s journey. It’s predominately about selling and conversion; it is intended to help sales teams adjust their pitch based on the stage the individual is in. The Sales Process Map provides several performance indicators: in which stage are we performing best? In which stage are we not engaging our prospects or customers very well? Where can technology assist our customers’ experience with our products and services, and in which stage should technology be best applied? What can we change in our delivery that is not technology dependent? What form of engagement should we pursue that best matches our core competencies and brand promise? Are there ways to leverage interactions in one stage with potential interactions in other stages to reduce costs and increase lifecycle branding opportunities? Because the sales process map is about selling to customers, I modified it slightly to represent the user experience. The number and size of the circles now represents the importance of that stage to a given user. I’ve consolidated the circles to simplify the map—Awareness may encompass Interest; Familiarization may bridge between Interest and Consideration. From a user perspective, the stages may not be so granular. The sizes will vary by type of product or service. So, for a specific user, the Familiarization stage may be much smaller for one service vs another. By looking at clusters of users, or Personas, we can begin to see which stages are more important than others on a Persona basis. 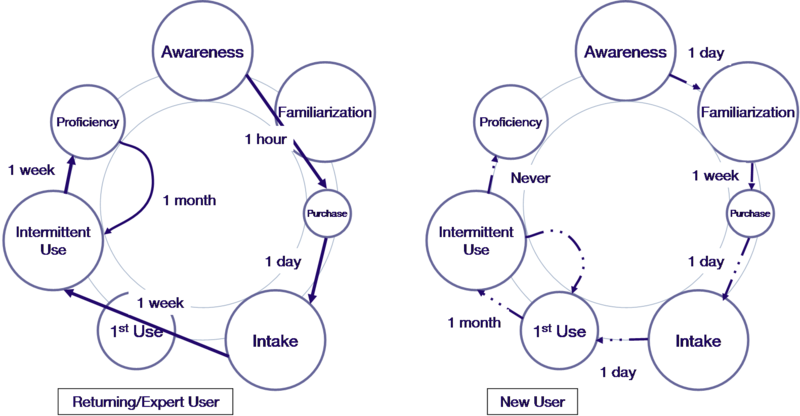 We can look at the time required to move between stages as another element of the user experience, and again, we may discover different Personas require different amounts of time to transition from one stage to another. Accounting for the differences between two Personas’ journeys reveals opportunities for design of the overall experience of use. Users (and customers too, but here I’m focusing on UX architecture) interact with the organization through specific “touchpoints.” Cataloging the touchpoints at each stage reveals opportunities for designing the users’ path through the experience. Note: for customer journey maps, touchpoints are designed in service of making a sale. But in the Lifecycle map it’s about improving the users’ experience with a product or service, leading to loyalty and return business. 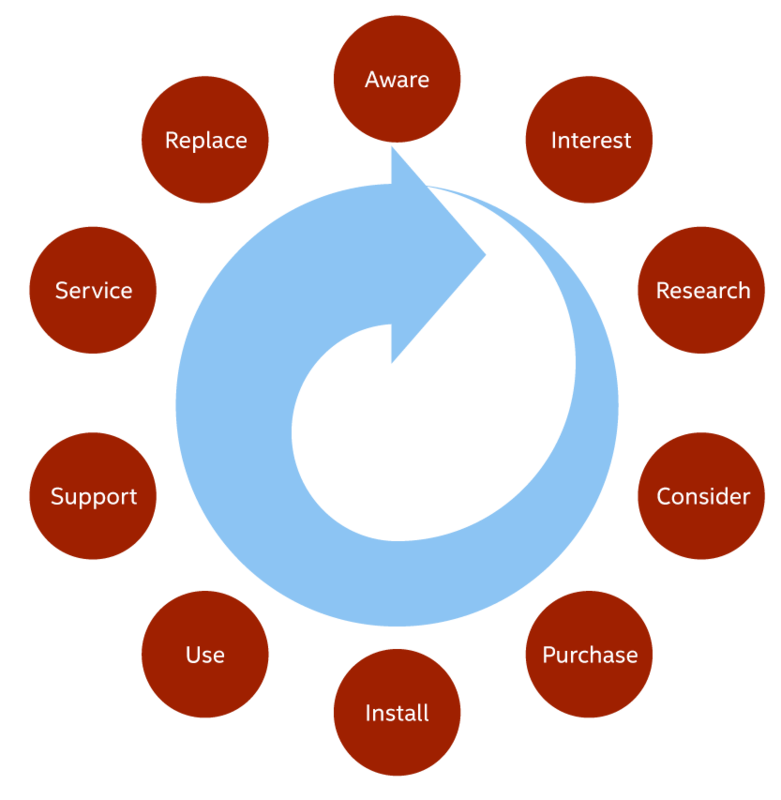 UX architecture is responsible for almost all of the touchpoints on the Lifecycle map. Certainly it is responsible for touchpoints highlighted in green (design) and in many cases the ones colored in red (indirectly through design of business processes or IT services). Naturally there are touchpoints that the enterprise can’t directly influence, but even with these, knowing they exist influences the design of the others. Whether they are using a map or not, enterprises always invest in creating the individual touchpoints: training materials, sales collateral, marketing messaging, or customer support scripts. This is a natural first step in working with customers and users. But UX architecture focuses on the pathway from one touchpoint to another. In designing the paths, the UX architect considers the touchpoints not as individual islands but as stepping stones along the garden path. Looking at them this way, the UX architect influences touchpoint design from outside the touchpoint itself. With this shift in perspective, the enterprise designs its touchpoints in service of the users’ desired experience, not simply in service of an internal set of metrics. In this context, the enterprise measures a touchpoint’s performance in two ways: the quality of its content or delivery, and how well it enables the user to move along the path. This shift has profound implications for the organization’s operations: touchpoints are no longer created in silos, defined by the org chart. Instead, the enterprise must take an outside-in view. What does the experience feel like for a first time visitor? For a returning user? Marketing can no longer operate independently of customer support. The “out of box experience” is as much a selling touchpoint as an advertisement or trade show demo. Operationally, this approach requires an executive sponsor responsible for coordinating across internal organization boundaries. That’s a tall order in many large enterprises where historically departments are measured on their own merits, not on a holistic outside-in user-centric view. Enterprises that leverage a customer- or user-centric view enjoy significant benefits and competitive advantages. In well designed architectures, early stage touchpoints reduce the cost of delivery of late stage touchpoints. Consider the iPhone’s lack of user manual. Much of how we learned how to use an iPhone was through advertising, marketing messaging and sharing among friends. Late stage support activities were reserved for truly necessary engagements. In the prior article, I used the example of a manufacturer shifting from a simple drinking glass to an “intelligent” drinking glass. The manufacturer of the simple tumbler uses the Lifecycle map to manage customer experiences. Because sales and marketing already understand how prospects become customers, they use the map to measure their performance. In some cases, marketing uses the map to contrast an intended experience against the actual experience, revealing opportunities for improvement. The organization uses the map to hone its competitive advantage by revealing gaps in the customers’ journey. In contrast, enterprises working in new ecosystems, such as an intelligent drinking glass require the Lifecycle map; it’s not a nice-to-have, it’s essential. Which Persona learns about this glass? How do they learn about it? How does that initial exposure contribute to their purchase, and their eventual use of the glass? When and how do they first see it used, or try it themselves? How does the purchase process integrate into first use? How does the “out of box experience” relate to the Persona’s original exposure; to their downstream continued use? How does the channel educate its customers on the use of the glass? These are not questions that can be answered by measuring current users or customers—the experiences don’t yet exist! Organizations working on known knowns, or known unknowns, benefit from the Lifecycle map through improved performance management. In the context of unknown unknowns, though, the enterprise can’t rely on past as prologue. Unknown unknowns are the province of disruptive innovation, and, by definition, cannot be resolved through analysis or existing patterns. These engagements require experimentation to understand and reduce the risks of the unknown. Successful innovation, especially disruptive innovation, builds on the past even as it introduces key differentiators. The challenge for the enterprise is knowing which differentiators are key, how to deliver them and how to design the entire experience so that it makes sense to this new set of customers and users. The Lifecycle map is one tool the enterprise can use to reduce risks of innovation. It provides the enterprise with a bird’s eye view of potential pathways for future users; potential pathways that can be tested and risk-reduced. The Lifecycle map becomes a lens into the future—an experience roadmap. Disruptive innovation, by definition, is more than an incremental shift in prior offerings. As a result, the enterprise must grasp the new context of use to fully leverage the disruption and make it a competitive advantage. Consider the intelligent drinking glass: something about the addition of intelligence affords a competitive advantage, right? But if people only use the new glassware as they have used drinking glasses in the past, the enterprise has failed. It’s failed to leverage the benefit of the new technology to provide competitive advantage or offset its cost. But again, by definition, because this is a disruptive innovation, the company won’t be successful by relying solely on its existing or prior Lifecycle map. Those maps can’t identify key pathways, touchpoints or linger times. The UX architect, through the Lifecycle map, reveals these opportunities. UX architecture is a comprehensive vision of the ecosystem of use for an enterprise’s products and services. This is a relatively recent notion in the annals of product development and innovation. Think about disruptive technologies from the past century. Thomas Edison is considered one of the great innovators of that time. In the area of audio recordings, he imagined profitable businesses and an entire entertainment industry based on mass produced cylinders. He hedged his bets by creating recordable cylinders for business dictation. Is it fair to suggest Edison was a UX architect? Probably not. No account of his inventions, or his process, suggests he took the users’ point of view. He was a technologist who could envision business models from his inventions. Certainly Edison hadn’t imagined the ecosystem of the mid-20th century recording industry, with pre-recorded music, its production, distribution and sale. And surely he couldn’t have imagined the current music industry with instantaneous transfer from listener to listener, or the blurring of lines between producers and consumers. Those inventions relied on the shifting landscape and evolving infrastructure that have their roots in Edison’s wax cylinders, but were impossible to envision in the late 19th century. Are we any more skilled at envisioning the future of the intelligent drinking glass? Probably not; but sketching an ecosystem of use, along with a Lifecycle map would reveal more than just technical breakthroughs or patents. Our Personas’ paths through a Lifecycle map, would reveal infrastructure gaps, alternative business models and go-to-market strategies required to make the new technology a success. UX architecture enables enterprises to reduce risks while increasing opportunities found within emerging ecosystems of use. Again, in Snowden’s Cynefin framework, we are in the Complex quadrant where analysis-based risk reduction strategies won’t help. And time isn’t on our side. Competition emerges from places we least expect. New enterprises spring up with nothing to lose that can afford to fail spectacularly in service of learning. Startups can craft new offerings in a matter of days at minimal expense, solely for the purposes of testing a business model or market segment. In contrast, market leaders rely on their past success: the tools and processes that got them to their current leadership position. But when the new context is so different from what we know, when we are pushed to conquer new ground before we have fully comprehended it, we can’t rely on those same tools. They blind us to the very elements in the emerging ecosystem that would make us successful. We must design experiments that let us fail intelligently. We must learn by trial. Not trial and error, because that implies we knew in advance there was a right way to proceed. We advance through a series of well-designed trials to reveal the landscape. And we have to do it quickly. How can we build UX architectures that reveal and illuminate these emerging ecosystems of use? How can we know the Lifecycle maps are reliable? Again, the Complex quadrant requires us to think about it differently: we aren’t describing an existing environment; we are exploring it. We document the emerging ecosystem of use by creating it. As Alan Kay famously said, The best way to predict the future is invent it. In the same way, we build UX architectures by inventing the new ecosystems of use and observing how our users navigate it. In the next installments I go into more details about what it means to invent an ecosystem of use, and how we observe people navigating through it.